Fancy sports car. Spotted at a Target. 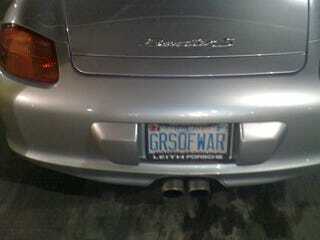 North Carolina plates that read "GRSOFWAR". Gears of War is developed in North Carolina by Epic Games. Could it be the car that Cliff Bleszinski, Gears' lead designer, tools around in? A LP560 Gallardo Spyder. Forget the Porsche or the Lambo, we'll be honest, we were rather disappointed to see Bleszinski doesn't drive a Miata or a Buick. Whaddaya gonna do. Guesses on his vanity license plate? "DUDEHUGE", anyone?